HomeArchiveAmerican Free Press Is Under Attack! The High Priests of Political Correctness Are at It Again! Let’s be honest. As far as cash reserves go, the bank account of American Free Press is usually as empty as Mother Hubbard’s cupboard. We struggle every month to make ends meet, but always get the job done. We publish a real newspaper—not one loaded with the kind of fake news you get from the controlled media and so many “alternative” media outlets who don’t bother to check the facts. That’s right: Our bank account is small, but our staff and writers have the hearts of lions. And though our print subscribership is relatively small and we are lucky to crack the top 75,000 websites in the world every year, we certainly get noticed by a lot of high-powered agitators. Just recently, for instance, Internet giant Google informed us that they will no longer do business with us. On February 9, we received a termination notice from the brass at Google ending our advertising contract. The reason? AFP is, in a nutshell, too politically incorrect for them. Incidentally, we were making just $144 a month from what is known as Google Ad Sense. Google Ad Sense monitors website traffic and discovered last year that AFP’s Internet site, staffed by just one part-time employee, had, on average, nearly 400,000 different people reading a grand total of over 1.7 million pages on our website every month. Despite the small staff and the minimal budget, these are very good numbers for some of the “big boys,” let alone one small, independent newspaper fighting for its existence. But Google didn’t care. They informed us our relationship was over—without the right of appeal—because of what they called a “site-wide violation of policy” related to articles and products they think are too hot to handle. Fine, we figured. What’s $144 a month in the grand scheme of things? But then we thought we’d look a little closer. Recently, a wide-eyed, wet-behind-the-ears journalist named Tess Townsend, writing for a website named “Recode,” made a shocking admission. Google did not make this decision on a whim. No. This massive company was pressured into the move by an allegedly “non-profit” gang of “free speech watchdogs” called Media Matters for America, a group once sued by C. Boyden Gray, former White House counsel for George H.W. Bush, for violating the rules of non-profit organizations by using their website as a platform to smear conservatives. In 2011, Gray sent a letter to the IRS alleging that Media Matters’s activities were not primarily educational, but instead “unlawful conduct.” He asked that the tax-exempt status of Media Matters be revoked! And it should have been. But who is Media Matters, and why does it matter? Media Matters for America was started in 2004 by a man named David Brock (the former boyfriend of James Alefantis of Comet Ping Pong Pizza fame). Their office space was initially supplied free of charge by John Podesta, with whose name you are no doubt familiar. And guess who gave her time as a volunteer consultant for Media Matters in the early days of its formation? None other than Hillary Rodham Clinton. But let’s delve a little deeper. A non-profit organization like Media Matters, with a fancy website and a staff busting out of their D.C. offices (long-since moved out of the cramped office space supplied by Podesta) must have received funding from somewhere. But from where? And from whom? It turns out that Media Matters got a big kick start with a $2 million donation from a group called MoveOn.org. You remember them, right? They’re the group that helps organize anarchistic rallies against Donald Trump and other conservative politicians and journalists, supplying logistics and funds so leftists of all stripes can shut down cities, tie up traffic, and keep hardworking people like you and me from getting to work so we can feed our families while groups like Black Lives Matter and ski mask-wearing hooligans can destroy the personal property of businesses, throw bricks through shop windows, physically attack people they don’t agree with, and even rain down rocks and stones on average Americans trying to attend conservative political rallies. Hundreds of them were arrested during the Trump inauguration because, honestly, they could have killed people. And, according to D.C. police, they almost did. They have no concern for free speech. No concern for differing opinions. And they certainly don’t care a lick for anyone who won’t adopt their Marxist political agenda. The Left definitely does not practice the “tolerance” it preaches. By the way, MoveOn.org is directly funded by one of the richest leftist troublemakers in the world. You guessed it. Hungarian-American George Soros. It’s clear that nothing goes on at MoveOn.org that slimeball Soros does not know about personally. According to a CNN report, Soros himself donated $1 million to Media Matters in its early stages. In a 2014 interview, founder Brock said Soros’s donations only accounted for “less than 10%” of the budget of Media Matters. So, trust me when I say, there is a real move afoot to destroy free speech in America, led by some of the richest and best-funded billionaires and “advocacy” groups in the world. And American Free Press has now become a focus of these powerful culture munchers—ones that don’t really like that you and I have opinions about things that are in stark contrast to theirs. Yes, American Free Press is now on the front lines of a battle for freedom of speech. And what a battle it will be. Am I exaggerating? I don’t think so . . . They ALL have axes to grind with AMERICAN FREE PRESS . . . Does left-leaning Arianna Huffington have an axe to grind with American Free Press? Huffington, who went out of her way to commission a hit piece on American Free Press last year, was peeved when we wouldn’t just lie down and shut up after she trained both barrels of her smear machine at AFP. After she attacked us, we went on the offensive and exposed her as a fraud—a fraud who, judging from former employees, had more complaints from workers than the Wicked Witch of the West. Has she got money to burn? She sure does, as we’ll explain later. Does John Podesta have an axe to grind with American Free Press? Did we hit a little close to home with our honest coverage of his strangely intimate involvement with Hillary? Does Hillary Clinton have an axe to grind with American Free Press? Maybe a little. AFP sold literally thousands of copies of Hillary (And Bill)—Victor Thorn’s magnum opus on the crimes of the Clintons. Thorn is no longer with us, but he made his mark and ruffled that vulture’s feathers. Does George Soros have an axe to grind with American Free Press? Well, it’s AFP that has consistently exposed his involvement in nearly every anti-American “protest” group out there, from Black Lives Matter to pro-abortion groups to anti-Trump rabble-rousers and to slimy outfits like Media Matters, that insist all dissenting viewpoints be crushed without mercy. Now let’s do a little math . . .
• According to the website “How-Rich.com,” John Podesta is worth $12 million. • According to “CelebrityNetWorth.com,” Arianna Huffington is worth $50 million. • Bill and Hillary Clinton are alleged to be worth as much as $50 million. But we know that is a low-ball figure. According to The Washington Post (and we think we can trust them on this, but probably not for much else besides the weather and the sports scores), the Clintons have amassed a global empire including the Clinton Foundation that may be, in fact, worth $2 billion. • And what about George Soros? According to Forbes magazine, Soros was worth, in 2017—now take a deep breath—$25.2 billion. • And Google. You better sit down if you aren’t already. Larry Page and Sergey Brin are together worth a combined $498 billion! • The aforementioned president of Media Matters, David Brock, by the way, makes (according to its non-profit tax form for 2011) more than $286,000 per year. Do you realize that would pay every single staff member and freelance writer AFP employs for an entire year? That’s some high-octane pocketbook power—all trained on American Free Press. But what’s the real reason “THEY” hate AFP? • AFP refuses to kowtow to these overlords of the mass media and politics? • AFP refuses to run their cookie-cutter fake news stories and instead debunks them? • AFP—with the support of our readers—consistently scoops them issue after issue? • AFP actually checks facts before running with a story? • AFP—alone among all independent news media—has managed to continue to publish a newspaper in print and on the web, on a shoestring budget, that consistently outperforms the largest media outlets in the world? • AFP is not controlled by advertisers, lobbying groups or the CIA? If you know anything about “Operation Mockingbird,” you know the CIA has a long history of using the mainstream media to plant stories designed to condition the American public for war. Is it possible American Free Press irritates the masters of the media more than any other news outlet in business today? Well, whatever we are doing, the likes of those mentioned above apparently have a hive of African killer bees in their bonnets. They are determined to shut us up. THAT’S NOT GOING TO HAPPEN! But we have to admit: There is only one way we can survive to win this battle. Fortunately, we have something all those billionaires and millionaires and media moguls don’t have . . . a dedicated group of subscribers and supporters—average Americans—who understand the importance of a truly independent media. And you are one of these people. You are all our dedicated partners in our effort to get the truth out. We’re not asking for a billion dollars. Nor a million. Nor $100,000 . . .
We just want enough to keep on publishing, to keep on irritating the powers that be by not giving in. And we vow that we will keep publishing until we either drop dead or emerge victorious. By surviving . . . we win. And so does America. Without American Free Press, what is there, really? Just a tiny handful of papers that are in the same boat as AFP. We can count them on one hand. And kudos to them as well. But let’s be honest. Of those, AFP is the loudest, most effective independent voice for freedom in this country today that is not controlled by outside, un-American agitators. As long as you like what we are doing and are willing to open your wallets every few months and send in whatever you can, we will not be silenced. Your support means we will never be forced to crawl up to the altar of fake news and worship at the feet of the high priests of political correctness. 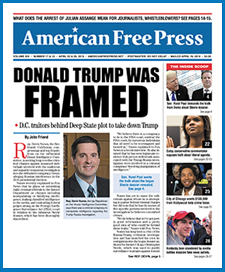 AFP may very well be the last real newspaper in America with any substantial voice. But, without you, our voice could one day go silent. And that’s no lie. We’re not in it for the profit. We’re in it for America. And we know you are, too. P.S. To the list of high-powered muckety-mucks who want to silence AFP, you can add the Anti-Defamation League (net assets of $90 million for 2015) and the Southern Poverty Law Center (currently worth more than $250 million). They have been trying since we started to shut our doors—but have failed again and again. P.P.S. While piecing together this request for assistance, I just got word from our webmaster that YouTube, the massive video channel, can be added to the list of companies that want our message censored. Worth between $26 billion and $40 billion, according to online estimates, YouTube has given us our first “strike” and suspended our ability to post videos on their site for 90 days. Why? One video we posted about the suppression of free speech in Canada is too politically incorrect! Where does it stop? It’s time to draw our own line in the sand. . . . Call 1-888-699-6397 toll free to charge a donation, Mon.-Thu., 9-5, or mail to AFP, 16000 Trade Zone Avenue, Unit 406, Upper Marlboro, MD 20774. If you would like to talk to an AFP staff member about donating, please call 202-544-5977. You can talk directly to me by calling that number and the operator will gladly transfer the call. 4 Comments on American Free Press Is Under Attack! perhaps if you actually posted the comments left on your page you’d get more support? As a long time past subscriber – my subscription had lapsed due to a move & a long illness. I’m doing well now & just renewed via a 4 mo. sub. & look forward to having my American Free Press newspaper in my hands again. I feel it is the only real news out there & love all the writers. God bless you all & keep the AFP going strong into the future.